(Nanowerk Spotlight) Graphene is just spearheading researchers' foray into the world of two-dimensional (2D) materials. Besides carbon, molybdenum (MoS2), tungsten (WS2), and vanadium (VS2) all promise new material systems with unique properties and performance for a range of application areas. Functionalized graphene, for instance, holds exceptional promise for biological and chemical sensors. Now, in new work, researchers from the Nokia Research Center in Cambridge, UK, have shown that the distinctive 2D structure of graphene oxide (GO), combined with its superpermeability to water molecules, leads to sensing devices with an unprecedented speed. "It has been well known that graphene oxide can be very sensitive to water, and that this material is specifically permeable to water molecules," Stefano Borini, a Principal Researcher at the Nokia Research Center, tells Nanowerk. "However, the ultimate performance in terms of speed had not been reported yet." 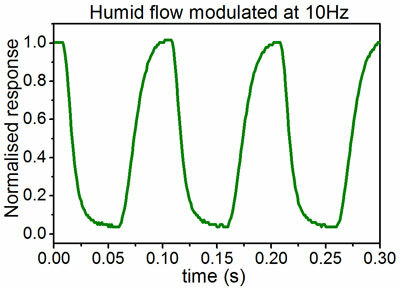 In the November 9, 2013, online edition of ACS Nano ("Ultrafast Graphene Oxide Humidity Sensors"), first-authored by Borini, the Nokia team reports the experimental observation of the unparalleled response speed of humidity sensors based on graphene oxide, which are – to the best of the scientists' knowledge – the fastest humidity sensors ever reported. Such exceptional performance is intimately related to some unique properties of graphene oxide: the super-permeability to water and the two-dimensional nature. Borini and his colleagues started to study graphene oxide based sensors because they were looking for scalable, low-cost sensor solutions which could also exhibit good performance. In the course of this work they realized the possibility of making ultrathin films in a very easy way, such as by spraying, and discovered the exceptional sensing performance of the material. In their experiments, the researchers demonstrated response and recovery times – defined as the time to go from 10% to 90% of the high humidity value and vice versa – of less than 100 ms, with the thinnest films being able to respond up to 40-50 Hz. They found that the response rate is a function of the thickness of the GO films, for instance with 25 nm thick film being clearly slower than the 15 nm one. This means that the tuning of the film thickness would allow engineering of humidity sensors with optimized speed. "The ultrafast response speed of these sensors allows us to observe the modulation of moisture in a user's breath, and we demonstrate this feature in a whistled tune recognition application," says Borini. "Moreover, the same concept may be explored in the case of different 2D materials, such as functionalized graphene and 2D transition metal dichalcogenides, in interaction with different vapors and gases for the realization of ultrathin nanoporous films for sensing applications." While humidity sensing may be useful for a lot applications, some of them are of limited use due to the fact that the standard response and recovery times are too long. Now, though, the fast response times of these GO humidity sensors enables entirely new user interfaces to be designed, e.g. sensing the moisture from a user's breath. This would make it possible to monitor both breathing and speaking. 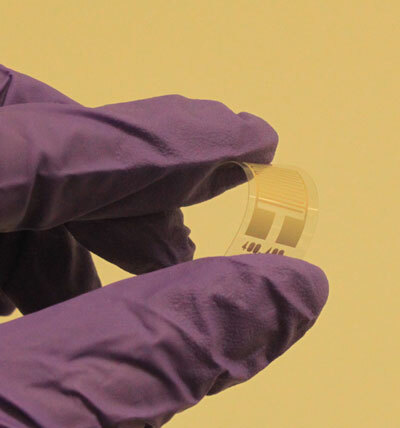 The graphene oxide sensing film that the team developed is extremely thin (the thinnest is about 15nm), optically transparent, and mechanically flexible. This would enable humidity sensors in a wide variety of form factors including small wearable devices or even band aid-type skin stickers. Borini notes that, before we see commercial applications, there are still a few questions concerning graphene oxide films that need answering, including assessing the material's stability over time. Nokia has filed several patent applications regarding this work.